Yes these Frozen Lemon Meringue with mascarpone are crazy good . Start the day before you need them to freeze the amazing lemon ice cream. Being a close ( or crazy family)when I was growing up, we all lived within a small radius of a few houses. My Aunties, Grandmother and Great Grandmother were all within earshot of each other. This came about due to the fact that the area was predominately market gardens when they all settled here from England in the early 1900’s. Nanna Dearest…. as she liked to be called was beside us, with her chickens and fruit trees. There was a lemon tree in the yard between our place and my hers, it was a sort of fence in a way. It was in a thoroughfare, a place you had to walk . If you weren’t walking past then a ball was probably stuck under its fruit filled branches or the cat was up it and needed rescuing. This tree scared the hell out of us, as it was full of stink bugs that flew at us and spayed a toxic smelling spray. My Grandfather preferred not to treat them with chemicals, but was seen on the odd occasion with a pair of tongs, his beekeepers hat and a plastic bag to pick the smelly things off. We knew to stay well clear, as this caused the remaining bugs to try to hurtle towards the swearing man in the hat. My Grandfather got into trouble for swearing around us, but I thought the swearing was better than the chemicals. The smell of a home grown lemon can take me back to this time with just one sniff….. 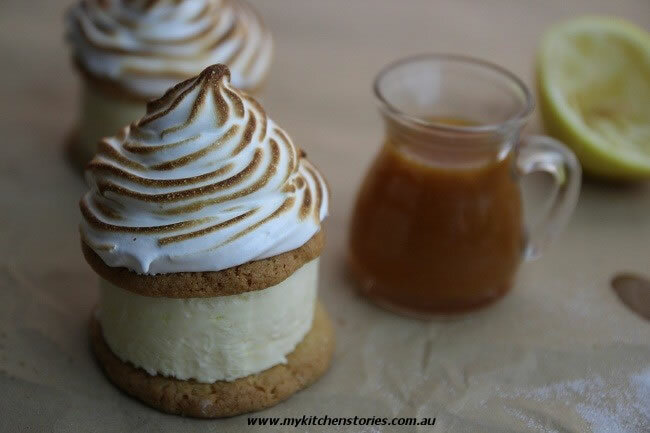 This Lemon dessert, smells of sweet lemon and tastes even better, it is my twist on Lemon Meringue Pie. 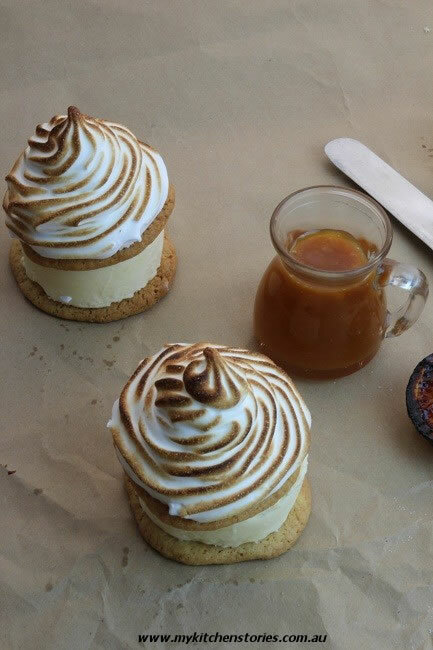 A frozen Lemon Mascarpone Parfait with Meringue to finish. Set the oven to 180 C/ 350 F Mix the flour. baking powder and soda together. Put the softened butter, sugar and zest into the food processor and whizz until white and creamy. Add the eggs and then lemon juice. ( the mixture will curdle). Add the dry ingredients and pulse till combined. Pour onto a bench top and roll into a log, wrap and refrigerate till firm. ( the mixture will be quite sticky). Cut into thin disks and bake at 180 for about 10-15 minutes. They expand quite a lot. Cut into the shape of your ice cream mould. To make the lemon parfait. This is a simple ice cream it's success depends on the beating of the yolks and sugar syrup. Beat the yolks in an electric mixer until very light in colour, thick and fluffy. Put the sugar and lemon juice into a sauce pan and melt on low without colouring until the sugar has dissolved. Pour the hot sugar syrup over the yolks a dribble at a time while beating until all incorporated. Beat this mixture till cool. Clean the bowl and beat the cream to soft peak. Fold the cream into the mascarpone mixture . Pour into a loaf mould or individual moulds. Beat the whites till lightly foamy and white. Gradually start adding the sugar until the meringue is glossy and thick. First pipe some meringue onto 6 biscuits. Using a blowtorch brown the meringue or pop under a hot grill till coloured. Put another 6 discs of lemon thins onto a plate. 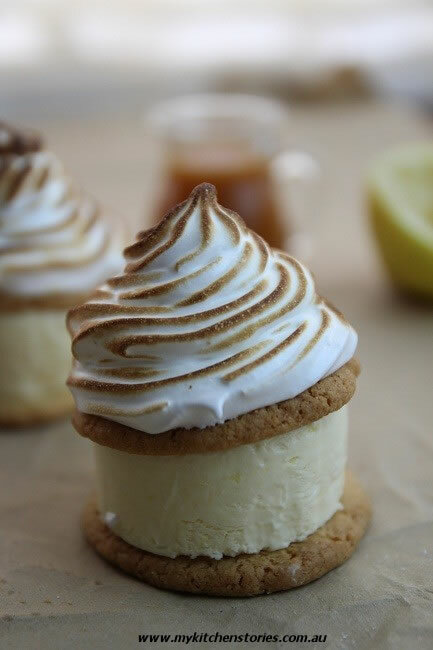 Top with the Lemon Mascarpone parfait, then top with the meringue layer. Serve this with fruit ( quinces or raspberries or strawberries or with lemon caramel sauce if you can handle more sugar) Caramelise the sugar till dark brown, add the lemon juice and cool slightly. Whisk in the butter and cool. 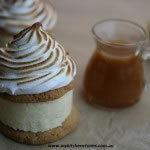 I love your spin on a lemon meringue pie Tania! It looks amazing. And it was so funny hearing your story about your family all living near each other. My family was the same, we all only lived a few streets away! Lorraine @ Not Quite Nigella recently posted..How Much Food Is Wasted? Behind The Scenes of Food Bank! Wow, these look gorgeous. I love the sound/look of these. I’m definitely going to have to give these a go. Thanks for sharing. Wow! I love it! 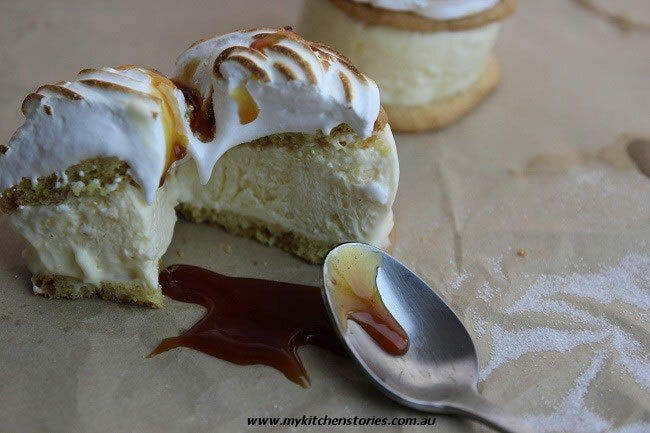 I still have some mascarpone in the fridge from when I made it and I was wondering what to do with it before I got sick of it and chucked it out! This is perfect! I haven’t used it in any sweet dishes yet. Thanks for the inspiration! Lemons plus mascarpone is a match made in heaven – I love all the elements of this dessert, from the parfait to the meringue topping to the lemon caramel sauce! You really are so creative! You take a run of the mill lemon meringue pie and turn it into gorgeous little mouthfuls of heaven. I love how food can evoke such strong memories! This is beautiful, I would make this as dessert for a fine dinner party! Those meringue peaks look like absolute perfection! These sound absolutely delicious!! These look so pretty! And I like how your aunts lived near each other. I hate to use words like “amazing” and “awesome,” but these do look amazingly awesome. Fabulous recipe. Thanks for sharing. What a fabulous dessert! Really divine looking and sounding. what a dainty and delicious treat! i love the special touches like the sauce and the burnt topping. bravo! This is a phenomenal recipe! I just love it. I love the imagery of the stink bugs in the lemon tree too, haha, I have been known to head out with the tongs at times – I’m glad I’m not the only one. Thanks so much for sharing, I am keen to give this a go. This is so very elegant and delicious! How lucky you were to have your family so close! I bet you have some amazing childhood memories because of that. Your Frozen Lemon Mascarpone Meringues are beautifully done. Glad you found me too Catherine lets be bloggin friends! I’m loving some of the grown up twists on childhood favourites that have popped up in this months blog hop. Fancy ice-cream sandwiches look perfect for a dinner party. I. Want. To. Make. These.